Ethiopia is widely understood to be where coffee originated, although technically it probably first evolved in Southern Sudan. What is certain is that Ethiopia is regarded by most industry professionals as the most captivating and hypnotic origin of all. At their best, coffees from Ethiopia can be extraordinary; complex, floral, fruity, and delicious. It was a bag of Ethiopian beans that sparked my passion for coffee and opened my eyes to the wide variety of flavours that can be found in coffee. I know the same is true of a number of industry colleagues. Coffees from other origins can be powerful and exalting too, but it is to Ethiopian coffees that I find myself returning time and again. It wasn’t until the Yemenis had begun growing coffee as an agricultural crop that formalized cultivation and harvesting of coffee in Ethiopia took place. Exports of Ethiopian coffee began to develop through the 18th and 19th centuries with coffee being graded as either Harari (grown around the town of Harar) or for coffee grown elsewhere in Ethiopia as Abyssinia; the Arabic derived name for the historical Ethiopian Empire which was a geographical area comprising northern Ethiopia and parts of Eritrea. Civil war came to Ethiopia in 1974 and lasted until 1991 when the military Junta was overthrown and a democratic government was established. The very best coffees tend to be from the Yirgacheffe region which spans the Gedeo zone and parts of Borena to the West. The heart of this region produces truly amazing tasting coffees. Today Ethiopia has many distinct coffee growing regions often with distinctive flavour profiles preserved and refined by a lack of trading seeds between regions. 80% of Ethiopian Coffee exports come through the ECX (Ethiopian Commodity Exchange) with the remaining 20% coming from cooperatives and therefore traceable to a specific area. Coffees sold through the ECX can still be very good but the beans used to make up these coffees are mixed together from various regions depending on their size (grade). This is less desirable for specialty coffee as it clouds the individual flavour characteristics of what are often very good coffees as they become lost when mixed with beans from other regions. Broadly speaking there are 5 primary growing regions in Ethiopia; Sidamo, Yirgacheffe (technically a sub-region of Sidamo), Harrar, Lekempti and Limu/Jimma. Increasingly excellent quality lots are coming out of Guji with promising coffees produced in Bale (West Arsi) and Bench Maji also. 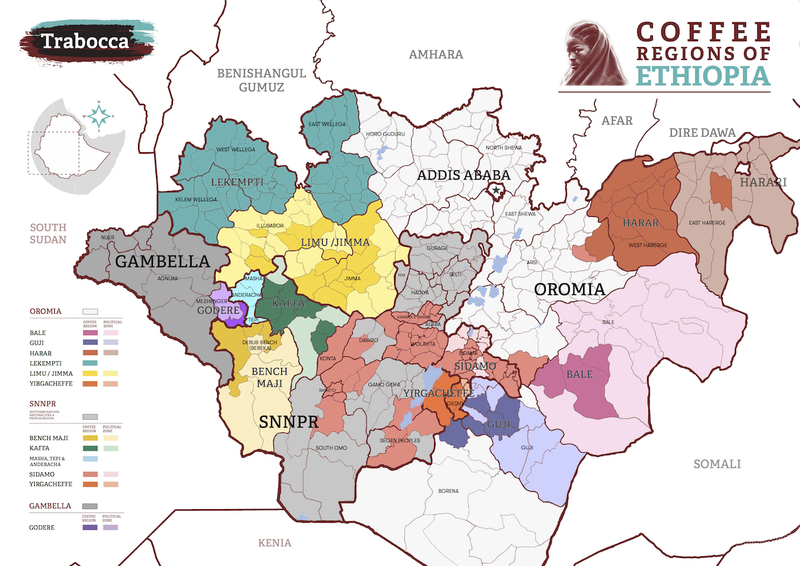 Three of these regions; Harrar, Sidamo, and Yirgacheffe were trademarked by the Ethiopian Government in 2004. Sidamo produces coffees which are aromatic and fruity often with a winey acidity. They are dependably satisfying with the finest examples Coffees from Harrar can be quite unusual with good naturally processed examples offering distinctly blueberry-like flavours. Although some coffees from Harrar can be musty and unpleasant it has a solid and longstanding reputation for quality which is explained in part by the historical significance and history of the region in Ethiopian coffee production. 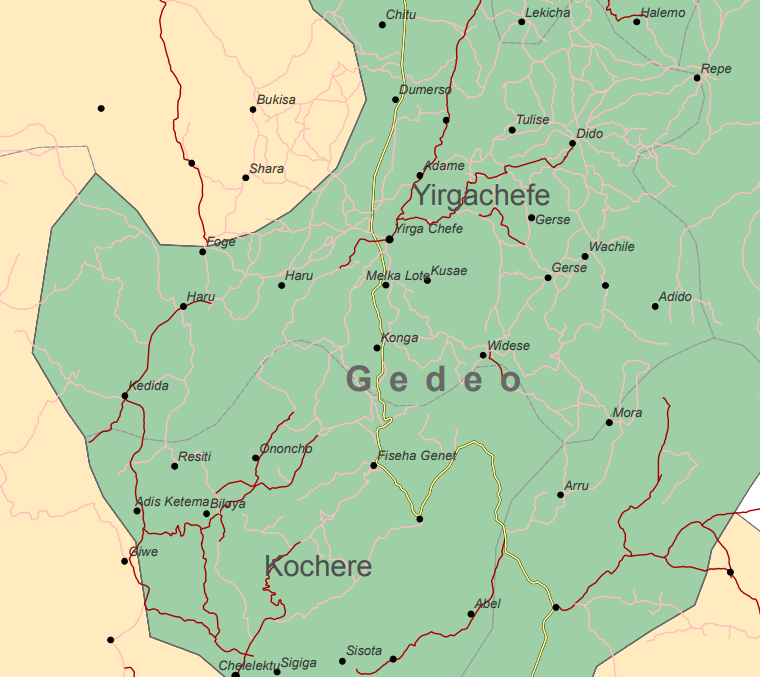 The very best coffees tend to be from the the Gedeo zone incorporating the Yirgacheffe and Kochere areas. The heart of this region produces truly amazing tasting coffees. They are balanced and refined with floral and Jasmine notes. Often they offer flavours of Peach, Apricot and nectarine alongside a plethora of citrus notes. The short term future of the Ethiopian Coffee Industry is positive, with exports of specialty lots outside of the ECX increasing steadily and being enjoyed by more and more coffee enthusiasts around the world. However, the threat of environmental change caused by Global warming is a cause for concern for producers in the medium and long term. Already swathes of trees have died in parts of Harar and although relocation to higher areas has happened in a proactive attempt to maintain levels of production, by around 2040 these steps will have been exhausted and the growing regions will have reached the top of the mountain.